The Commission for the Preservation of the New Order, commonly referenced by its acronym COMPNOR, is an umbrella organization for various entities that are designed to enforce the will of the New Order, spread the ideas of the New Order, bolster Imperial morale, and finally, crush the Empire's opposition. Replacing the Galactic Republic's COMPOR (Commission for the Protection of the Republic), COMPNOR is a key asset of the Galactic Empire as it both increases public awareness of the ideologies of the New Order and sets forth improving Imperial-controlled territories, increasing security and improving the quality of life for citizens. 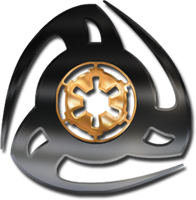 COMPOR was a Republic committee established during the Clone Wars to brainstorm ideas and reforms that could be implemented to ensure the continuation of the Galactic Republic during those troubled times. After the establishment of the Galactic Empire, the committee became largely defunct until the reign of Emperor Trey Connel. As part of his reforms to the Imperial government, Emperor Connel reformed the committee as COMPNOR. At its outset COMPNOR housed all the arms of the Empire that fell outside the traditional military arms of the Army and Navy. These departments could also be described as the wheels that made everyday life function in the Empire. Over the years, COMPNOR's internal organisation has undergone radical changes, partly as new departments were created and disbanded in accordance with the necessities of the day and partly due to responsibilities being transferred to independent ministries, many of which were subsequently reabsorbed into COMPNOR. Some of the now defunct organs of COMPNOR were the Imperial Corrections and Penal System, the Imperial Office of Criminal Investigations, COMPForce and the Imperial Department of Psychological Studies and Evaluation. During the early second reign of Vodo Bonias, COMPNOR was reduced in importance, with most of its administrative functions being transfered to the seperate Imperial Government under Grand Moff Zerk. During this period COMPNOR consisted primarily of the Empire's paramilitary and security agencies. In Year 10, the branches within the Ministry of Operations and Ministry of Truth were reorganised under COMPNOR, restoring it to its former importance. Upon the reunification of the New Imperial Order and the Galactic Empire, the Ministry of Industry and Regional Government were established as independent branches, rather than sub-branches of COMPNOR. After this reorganisation, COMPNOR consisted of three aligned Coalitions; the Coalitions for Diplomacy, Improvements and the Progress. Each was led by a Vizier, who held a seat within Imperial High Command and the Select Committee of COMPNOR, chaired by the Grand Vizier. The Coalition for Diplomacy trained the diplomatic corps of the Empire, while its Vizier expanded the Empire's influence with foreign interests. The Coalition for Improvements contained the Departments of Planning, Finance and the Resources Allocation Department of the Empire. The Coalition for Progress contained by far the most departments, with the Imperial Art Society, Information Service, Academy, Scenario Modding Committee, Gaming Commission, Centre of Recruitment and the Development Team. In addition to these Coalitions, the Imperial Security Bureau also operated as its own branch within COMPNOR, and was overseen by the Grand Vizier. While the previous structure of COMPNOR was highly successful, Emperor Seele made further reorganisation efforts to the leading political party of the Empire upon His ascension to the Throne. Most significantly, the Coalitions were reorganised into Ministries, while the Coalition for Diplomacy was dissolved and its portfolio was withdrawn within the purview of the Imperial Throne. In addition, the Ministry of Industry was consolidated into COMPNOR under the Grand Vizier. Conjointly, the Imperial Security Bureau was integrated within Imperial Intelligence, no longer operating within COMPNOR. The Select Committee is the body that administers COMPNOR; a group comprised of appointed individuals and COMPNOR department heads representing the pinnacle of the civilian government agencies and bureaus within the massive machinery of the Empire's central government. Chaired by the Grand Vizier, the Select Committee seeks to maintain stability, develop initiatives to improve and further the New Order, and support the other branches of the Galactic Empire in achieving the wishes of the Emperor. Members of the Select Committee are chosen from the most loyal high ranking officers within COMPNOR, and a position is reserved for former Emperors in good standing. Each of the following Ministries is overseen by a Minister holding a seat within the Select Committee. To become a member of COMPNOR, an individual must have at least six months' experience working within the Empire, no major infractions on his service record, and be a Class A citizen. A background check is conducted by the Imperial Security Bureau to determine if they are qualified to join. The Select Committee will ultimately decide for someone is fit to join one of the sub-branches. As several branches work daily with sensitive information, this is a necessary precaution. Preteen and teenage human children are encouraged to join their local Sub-Adult Group, a paramilitary youth organization that instills loyalty to the Empire and prepares youth for enlistment in the Imperial military. This page was last modified on 20 February 2019, at 05:13.